Today, we were lucky enough to have a meeting with one of the top HR experts in the country. The discussion centred on how poorly HR has been managed in small and medium enterprises, leaving it a sizeable contributor to business failure. From an accounting perspective, what could be an explanation? Although there are many self-professed payroll experts, few have the experience and qualifications to consider themselves authorities on the issue. While many have a basic understanding of the relevant software, most fail to grasp the full implications of compliance with payroll systems and the subsequent transactions. Some business owners choose to forget experts altogether and attempt to manage their payroll themselves, usually using outdated and flawed methods. Alternatively, a few accounting and bookkeeping provide payroll services, but these tend to solely give out advice, leaving the actual process to business owners or their contractors. HR and Payroll are immense problems that have been attracted very little attention from business owners. Believe it or not, we are currently looking after over 300 sets of books from businesses ranging from $50,000 to $20 million per annum and the biggest expense in their books is always salary and wages. Think back - if you spent 40-60% of your budget to salary and wages, how much did you really invest to make sure that it was managed properly? In our opinion, at least 1% of salary and wages should be invested HR, and a further 1% should go to payroll processing and compliance management. So if you have 10 employees receiving a salary package of $100,000 per year, you should put aside $10,000 for HR and $10,000 for payroll management, so as to ensure you are not only legally covered but also getting the best return on your biggest investment! In 2009, we were first introduced to cloud accounting, which was web browser accounting software like Xero. We really like it and strongly believe that it will be the future! 10 years into this technology and changes, we think Cloud accounting might not be the future anymore, even though there are still businesses and accountants who are still scare away from the Clouds. So what should be the next? We predict the future of accounting software in general to be more decentralised. Each business, each user will be using very different software. Accounting functions also will be varied in different area of business. We think that cloud accounting will actually disappear in SMEs. The SMEs would be able to employ simpler business applications to manage some parts of their accounting function. The applications would be able to process financial data for management and compliance purposes. Jane is a coffee shop owner. She is using multiple business applications to auto-feed her financial data into accounting software. It could be Xero or Intuit QuickBooks. In the future, Jane might not need a cloud accounting software to manage all complicated accounting transactions since her business applications could be able to do just what Xero or Intuit QuickBooks is capable for. Point of Sales (POS) application should be good enough to produce a comprehensive sale reports for Jane to keep track of her financial sale performance. POS could also be able to integrate to the ATO database so ATO could collect GST and tax information instantly. What about bigger guys in town? XERO entered Australian accounting software market seven years ago. They used to be a boutique-sized business; however, they brought a disruptive innovation that has changed the landscape of accounting industry. Software used to be installed in our computers; and accounting data were handled mostly offline from our desktops. When XERO came out, we just loved it. It allows us to access data from multiple devices. Our clients could now enjoy seeing financial reports from their mobile devices. Many of our clients love XERO because it is highly customised to their business needs. A grocery owner, who has been our client for more than four years, shared with me that XERO was the best software to handle hundreds of transactions and still able to generate real-time report. That is the reason clients choose to subscribe and stay using XERO for long term. Most people assume that bookkeepers and accountants get along very well―both share common goals and contribute to the long-term financial success of businesses and clients. The reality, however, is they tend not to share a lot of information with one another. Few weeks ago, a new customer asked us if we do tax preparation and lodging as he didn’t want to deal with too many parties (i.e. bookkeeper and accountant). I explained to him that bookkeepers and accountants work together as a team because they each have different skill sets and make up different stages of the financial cycle. Before engaging us as their bookkeepers, some of my customers have previously requested for their accountants to perform both bookkeeping and accounting for them. While many hope that their accountants can be “one-stop shops” for their financial needs, many realise that their accountants don’t offer bookkeeping services. So, should bookkeepers and accountants compete with one another, or should they cooperate with one another? Based on my past experiences dealing with business owners, clients, and accounting firms, I think that bookkeepers and accountants should dance around with each other to realise the best possible outcomes for their clients. But why are such harmonious and effective relationship shard to achieve most of the time? In my opinion, the problem lies with both accountants and bookkeepers. It went live this week! E-sign, a new improvement to Xero Tax, allows business to digitally sign, and submit their tax documents entirely only without the need of printing, signing or posting. Paperless tax returns are now real, and legal! The February Roadshow is the the first official event of Xero in 2016. Xero Roadshow came to Canberra on 4th February and attracted hundreds of local accountants, bookkeepers and entrepreneurs. Tailored Accounts team was one of them. Apart from amazing food, the Roadshow also gave plenty food for the brain. Here are what we have brought back from the event. As an outsourced bookkeeping services provider charging clients hourly (and of course, guarantee all jobs are completed at possibly highest standard), Tailored Accounts pays great attention on time tracking. It is time consuming for Tailored Accounts (and for any accounting practice) to record time accurately (but we need to do that for better performance management and billing clients). Why did we move to cloud accounting? Why did we move to Xero? Because of the software’s outstanding features? Because of benefits from the partner program? They are all correct. But the ultimate “because” was “because we wanted to be our clients’ choice”. Clients are always the motivation for all our innovations. One of the best innovations we made was converting the system to Xero – cloud accounting system. When we released Quotes in January, we let you know that we were going to continue to add to this feature. The initial release was the start of a journey, not the end. Over the past few months we’ve continued to monitor your feedback in our Community and have added new features to Quotes in each release. With this week’s release, we’re pleased to give you Online Quotes. As this is the last article of 2014, I will try to sum up what I have written for B2B during the past 6 months. I have introduced XERO – the world’s leading cloud accounting application along with its ecosystem which allows businesses to operate with their browsers instead of their desktops. I still remember this day 5 years ago when the IT technical support officer came to my office to install updates for my company’s server and computers. We ended up with 3 non-operating days due to a range of issues – bugs, non-alignment between the “old” and “new” updates, and conflicting dependencies. Technology will continue to evolve with added features, hence there are more reasons why companies should embrace cloud accounting. Time flies, it’s November already and with it comes the penultimate Xero release for 2014. Some big things just around the corner, more about those later. We are excited to announce the release of our new Android mobile app. The release will be rolled out during October to all new and existing users. Xero has added a number of new features to its software during August and September. In my last two columns, I introduced you to two of my favourite mobile applications – Xero and Receipt Bank. I use them on a daily basis and consider them to be part and parcel of my business. The growth in use of mobile devices has led to an explosion in the development of mobile applications. Small-to-medium businesses are using these applications to improve their processes and help their customers, while others have jumped on the bandwagon to develop their own applications for their staff to use or to sell as a product. Xero update: New features on the way! 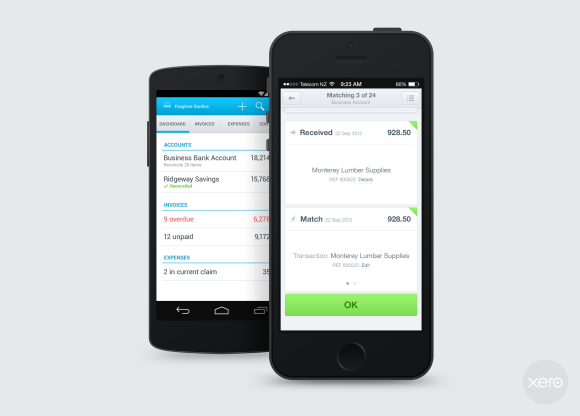 Xero is adding a number of new features for their customers from 21 July 2014. Here is a quick heads up beforehand. Xero Touch for iOS has now been updated to give you access to your files from your mobile device. Files for Xero was released back in October and was a game changer, allowing you to attach source documents to transactions, giving you a full picture of your financial data and supporting materials all in one place. Welcome to Files in Xero - a new feature that helps you store any business document you want next to its relevant transaction in Xero. Just drag and drop. Purchase Orders: How this Xero function would help businesses. Xero just moved a step closer to completing the remaining core accounting functions. Businesses now can create, send and manage Purchase Orders in Xero. This function will help put any businesses in control of purchasing from your suppliers, so you both know exactly what’s been ordered, the agreed cost, and when and where it should be delivered.